Learn the practice and processes of successful participatory video for social engagement, community empowerment, cohesion and development. The techniques and strategies you will learn will produce genuine participation, develop skills and confidence and give voice to the most marginalised and "hard to reach". This course will also enable you to integrate participatory media into your communications, marketing and documentation strategy. Help marginalised voices speak to power, decision makers and influence policy. Community outreach especially to the "Hard to Reach"
Community-led research, testimony and the production of knowledge. Positive interventions to address cliques, social exclusion, elitism, hierarchies and prejudices. How to ensure participants have equality of experience and voice. Positive ways to use the insider/outsider dynamic. Methods of introducing the technology to absolute beginners - even technophobes. How to ensure participatory and democratic editorial decision making. Screenings as outreach, research and dissemination. Conditions required for meaningful participation and sustainable media projects. Dealing with mixed language groups. Mark Saunders has been engaged in participatory media practices since the very first UK community video projects in the early 1980s and has a wealth of experience of participatory media outreach work with the so called " hard to reach." Mark, as Spectacle Director/Producer, co-ordinated media participation for two large European projects - Working Broadband GB and APaNGO - specifically designed to use media as a tool for engagement and to inform policy. 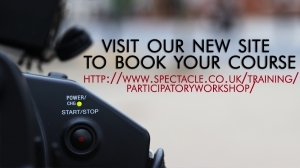 Spectacle was a core partner in Working Broadband GB (WBGB), a National programme that aimed to assist black and minority ethnic (BME) groups and individuals into the creative and technology industries. This EU Equal programme was aimed at producing large-scale innovative projects that have impact through a direct interface with emerging policies in member states. Spectacle was also a key partner in APaNGO (Advocacy, Participation and Non Governmental Organisations in planning). It aimed to develop best practice in community involvement in urban planning and to undertake a study into community involvement in planning across North Western Europe. At a special INTERREG organised session on media and documentation in Amsterdam our documentation and participatory media work on APaNGO was cited as good practice. For CIRÉ (the Belgian Commission for Racial Equality) we produced a series of short, participatory online clips and interactive DVD Quand les Papiers Arrivent... (When the papers arrive...) by and about the "sans papiers", asylum seekers awaiting the right to remain. It was distributed on DVD to all schools in Belgium. National TV showed a selection of clips every night at 10pm before the news for 2 weeks. Throughout its history Spectacle has provided that vital, trusted link between researchers and communities. Our work is known and respected across various relevant community and research networks and organisations. We have collaborated with academic researchers on community led-research projects. We are the only non-academic group commissioned for a research project by the Joseph Rowntree Foundation. The research programme, entitled Poverty and the Media, was a participatory project aimed at media decision makers. When Charles Picque, Minister for Economic Affairs responsible for Policy of Major Cities, commissioned a conference featuring the 10 best practice examples of urban participation from across the EU two, St Josse (Brussels) and Marsh Farm (Luton), were Spectacle projects. Mark has been a broadcast TV producer since 1990. For Channel 4 his films include “Battle of Trafalgar”, (Winner of Prix du Public International Festival du Film Documentaire Nyon, also broadcast in France), “The Truth Lies in Rostock” (Nyon Documentary Award Special Mention). “Outside The Law” and "Shaker Aamer: a decade of injustice" featuring interviews with Guantanamo detainees and their legal counsel have both been screened at the House of Commons. This course is aimed at anyone, with or without video skills, who intends to develop participatory input into their community, social and urban projects. This would include community and international development workers, social and health workers. Third Sector practitioners, cultural workers and artists who wish to develop participation as part of their outreach and idea development "tool-kit." If you're interested in taking the course but can't make any of the dates listed, please get in touch anyway - we may be able to schedule additional dates or run as a One to One session.